Total Control, Dead Moon, Thee Oh Sees, White Lung, Screaming Females, Priests, Tenement, Amen Dunes, Gun Outfit, Milk Music, and more will play Los Angeles festival Beserktown II from August 14 – 16. This marks the first US show for Total Control since 2013 — main man Mikey Young is not a fan of touring — and festival organizers are saying it’s the band’s only North American date of 2015. (Apparently it’s their first show period since releasing Typical System.) The fest also marks a reunion of Denmark’s No Hope For The Kids. Festival passes are on sale now. All announced Beserktown II acts are listed below. 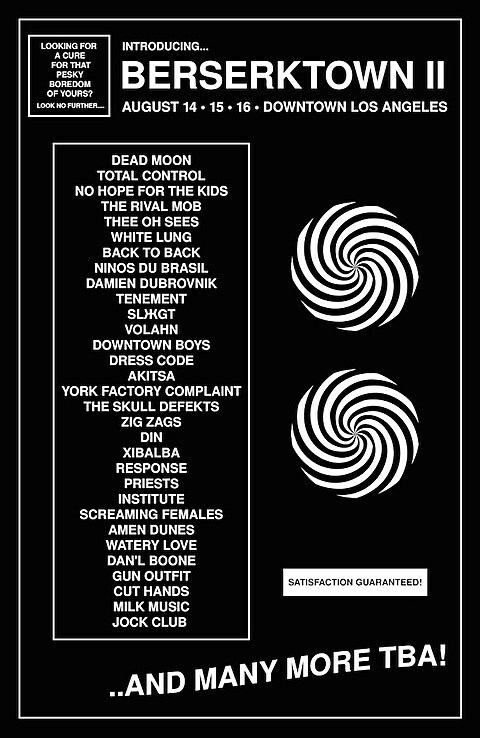 Reformed Pacific Northwest punks Dead Moon will also be in NYC in June.